Placard against fossil fuel transports, at the People's Climate March (2017). The environmental impact of transport is significant because transport is a major user of energy, and burns most of the world's petroleum. This creates air pollution, including nitrous oxides and particulates, and is a significant contributor to global warming through emission of carbon dioxide. Within the transport sector, road transport is the largest contributor to global warming. Environmental regulations in developed countries have reduced the individual vehicle's emission. However, this has been offset by an increase in the number of vehicles, and increased use of each vehicle. Some pathways to reduce the carbon emissions of road vehicles considerably have been studied. Energy use and emissions vary largely between modes, causing environmentalists to call for a transition from air and road to rail and human-powered transport, and increase transport electrification and energy efficiency. The transportation sector is a major source of greenhouse gas emissions (GHGs) in the United States. An estimated 30 percent of national GHGs are directly attributable to transportation—and in some regions, the proportion is even higher. Transportation methods are the greatest contributing source of GHGs in the U.S., accounting for 47 percent of the net increase in total U.S. emissions since 1990. As listed above direct impacts such as noise and carbon monoxide emissions create direct and harmful effects on the environment, along with indirect impacts. The indirect impacts are often of higher consequence which leads to the misconception that it's the opposite since it is frequently understood that initial effects cause the most damage. For example, particulates which are the outcome of incomplete combustion done by an internal combustion engine, are not linked with respiratory and cardiovascular problems since they contribute to other factors not only to that specific condition. Even though the environmental impacts are usually listed individually there are also cumulative impacts. The synergetic consequences of transport activities. They take into account of the varied effects of direct and indirect impacts on an ecosystem. Climate change is the sum total impact of several natural and human-made factors. 15% of global CO2 emissions are attributed to the transport sector. Worse, aircraft emissions at stratospheric altitudes have a greater contribution to radiative forcing than do emissions at sea level, due to effects several greenhouses gases in the emissions, apart from CO2. The other GHGs include methane (CH4), NOx which leads to ozone [O3], and water vapor. Overall, in 2005 the radiative forcing caused by aviation amounted to 4.9% of all human-caused radiative forcing on Earth's heat balance. Road traffic contributes to seed dispersal. How this compares to baseline dispersal in the habitat replaced by the roadway varies depending on the ecosystem. Unleaded gasoline has 8.91 kg and diesel has 10.15 kg of CO2 per gallon. CO2 emissions originating from ethanol are disregarded by international agreements however so gasoline containing 10% ethanol would only be considered to produce 8.02 kg of CO2 per gallon. The average fuel economy for new light-duty vehicles sold in the US of the 2017 model year was about 24.9 MPG giving around 0.36 kg of CO2 per mile. The Department of Transportation's MOBILE 6.2 model, used by regional governments to model air quality, uses a fleet average (all cars, old and new) of 20.3 mpg giving around 0.44 kg of CO2 per mile. In Europe, the European Commission enforced that from 2015 all new cars registered shall not emit more than an average of 0.130 kg of CO2 per kilometer (kg CO2/km). The target is that by 2021 the average emissions for all new cars is 0.095 kg of CO2 per kilometre. 2 per passenger mile (0.05 kg/km per passenger). Road and transportation conditions vary, so some carbon calculations add 10% to the total distance of the trip to account for potential traffic jams, detours, and pit-stops that may arise. 2 per passenger mile (0.12 kg/km per passenger). Some carbon calculations add 10% to the total trip distance to account for detours, stop-overs, and other issues that may arise. Electric trains contributes relatively less to the pollution as pollution happens in the power plants which are lot more efficient than diesel driven engines. Noise can be a direct impact on the natural environment as a result of railroads. Trains contain many different parts that have the potential to be thundering. Wheels, engines and non-aerodynamic cargo that actually vibrate the tracks can cause resounding sounds. Noise caused from directly neighboring railways has the potential to actually lessen value to property because of the inconveniences that railroads provide because of a close proximity. In order to combat unbearable volumes resulting from railways, US diesel locomotives are required to be quieter than 90 decibels at 25 meters away since 1979. This noise, however, has been shown to be harmless to animals, except for horses who will become skittish, that live near it. Pollution is another direct result of railroads on the environment. Railroads can make the environment contaminated and unnatural because of what trains carry. Railway pollution exists in all three states of matter: gaseous, liquid, and solid. Air pollution can occur from boxcars carrying materials such as iron ore, coal, soil, or aggregates and exposing these materials to the air. This can release nitrogen oxide, carbon monoxide, sulphur dioxide, or hydrocarbons into the air. Liquid pollution can come from railways contributing to a runoff into water supplies, like groundwater or rivers and can result from spillage of fuels like oil into water supplies or onto land or discharge of human waste in an unhealthy manner. Visual Disruption of railroads is defined as a railway changing the way that a previously undisturbed, pristine sight of nature looks. When man chooses to build a railway into the wilderness, he is forever changing the environment firstly by mere sight alone; a viewer will never be able to see the original scene again, and the builders of the railway often alter the landscape around the railway to allow it to ride. Frequent cuttings, embankments, dikes, and stilts are built which will change the way that landscape will look forever. Ballast water discharge from other sides of the world cause a certain type of pollution different from an emission type pollution as it introduces invasive species that can cause domestic species to go extinct. Discharges of sewage into our water bodies can come from many sources, including wastewater treatment facilities, runoff from livestock operations, and vessels. These discharges have the potential to impair water quality, adversely affecting aquatic environments and increasing the risks to human health. While sewage discharges have potentially wide-ranging impacts on all aquatic environments, the impacts may be especially problematic in marinas, slow-moving rivers, lakes and other bodies of water with low flushing rates. Environmentally this creates invasive species that often drive other species to their extinction and cause harm to the environment and local businesses. Emissions from ships have a much more significant environmental impacts; many ships go internationally from port to port and are not seen for weeks, contributing to air and water pollution on its voyage. Emission of greenhouse gases displaces the amount of gas that allows for UV-rays through the ozone. Sulfur and nitrogen compounds emitted from ship will oxidize in the atmosphere to form sulfate and nitrate. Emissions of nitrogen oxides, carbon monoxide, and volatile organic compounds (VOC) will lead to enhanced surface ozone formation and methane oxidation, depleting the ozone. The effect of the international ship emission on the distribution of chemical compounds like NOx, CO, O3, OH, SO2, HNO3, and sulfate is studied using a global chemical transport model (CTM), the Oslo CTM2. In particular, the large-scale distribution and diurnal variation of the oxidants and sulfur compounds are studied interactively. Meteorological data (winds, temperature, precipitation, clouds, etc.) used as input for the CTM calculations are provided by a weather prediction model. The road haulage industry is contributing around 20% of the UK's total carbon emissions a year, with only the energy industry having a larger impact, at around 39%. Road haulage is a significant consumer of fossil fuels and associated carbon emissions – HGV vehicles account for almost 20 percent of total emissions. 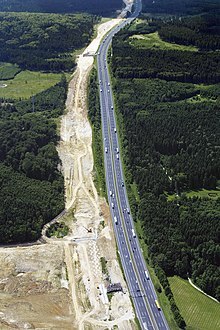 Construction of the route through the Kösching forest, north of Ingolstadt, Germany, had a large environmental impact but with Road-Rail Parallel Layout this would be less than using multiple routes. Road-Rail Parallel Layout is a design option to reduce the environmental impact of new transportation routes by locating railway tracks alongside a highway. In 1984 the Paris—Lyon high-speed rail route in France had about 14% parallel layout with the highway, and in 2002, 70% parallel layout was achieved with the Cologne–Frankfurt high-speed rail line. When changing how we use the road systems and how they factor into the amount of pollution they contribute, using existing roads is key for changing the current layout of our road system. When deciding to construct mitigation work, steps should be taken to install permanent and temporary access roads as needed to support drilling/development and production phases of the project, but minimize the number and length of such roads. For drilling activities, using old or two-track road access rather than constructing a higher quality access road. Develop a traffic management plan for site access roads and for use of main public roads. Develop and implement measures to control off-highway vehicle traffic off of newly constructed access roads. Limit traffic to roads and portions of rights-of-way indicated specifically for the project. Instruct and require all personnel and contractors to adhere to speed limits to ensure safe and efficient traffic flow. Encourage project employees to carpool to work sites. Limit construction vehicle traffic on public roadways to off-peak commuting times to minimize impacts on local commuters. Restore roads to equal or better condition than before project construction after the heavy construction period is complete. Lastly, controlling dust along unsurfaced roads—especially near residences and farm fields—may help prevent mixture of plants that can lead to disputes over patents. Mitigation does not entirely involve large-scale changes such as road construction, but everyday people can contribute. Walking, cycling trips, short or non-commute trips, can be an alternate mode of transportation when traveling short or even long distances. A multi-modal trip involving walking, a bus ride, and bicycling may be counted solely as a transit trip. Economic evaluations of transportation investments often ignore the true impacts of increased vehicular traffic—incremental parking, traffic accidents, and consumer costs—and the real benefits of alternative modes of transport. Most travel models do not account for the negative impacts of additional vehicular traffic that result from roadway capacity expansion and overestimate the economic benefits of urban highway projects. Transportation planning indicators, such as average traffic speeds, congestion delays, and roadway level of service, measure mobility rather than accessibility. Large retail corporations in the most recent years have focused their attention to eCommerce spending. As a result, many industries compete to get products and services in the hands of their consumers. In order to beat out competition, many of these corporations created incentives to make customers buy from their online store instead of another. The most popular incentive among customers turned out to be either free, fast, or 2- day shipping. While these shipping options get products and services to the hands of buyers at unbelievably fast rates than ever before, there a negative externalities to public roads and to climate change. E-commerce shopping can be seen as the best way to reduce one’s carbon footprint. Yet, this is only true to some extent. Shopping online is less energy intensive than driving to a physical store location and then driving back home. This is because shipping can take advantage of economies of scale. However, these benefits are diminished when e-commerce stores package items separately or when customers buy items separately and do not take the time to one stop shop. For large stores with an large online presence, they can have millions of customers opting for these shipping benefits. As a result, they are unintentionally increasing carbon emissions from not consolidating their purchases. Josué Velázquez-Martínez, a sustainable logistics professor at MIT notes that "if you are willing to wait a week for shipping, you just kill 20 trees instead of 100 trees." The only time shipping works in being less energy intensive is when customer do not choose rush delivery, which includes 2-day shipping. M. Sanjayan, the CEO of Conservation International, explains that getting your online purchase delivered at home in just two days puts more polluting vehicles on the road. In addition to standard shipping, consumers must be satisfied with their purchases so that they do not constantly returns items. By returning shipments on standard shipping, the positive contribution to environment is being taken back. In research done by Vox, they found in 2016 transportation overtook power plants as the top prouder of carbon dioxide emissions in the US for the first time since 1979. This environmental impact came from nearly a quarter of transportation trucks that either carry medium and heavy duty loads of merchandise; these trucks are often the ones doing ecommerce shipping. This is the market for shipping pollution. The optimal quantity and the optimal tax per unit of pollution can be found at the intersection of MAC and MD. As the quantity of pollution decreases (emissions), the cost to decrease each marginal unit of pollution increases. Since 2009, UPS deliveries have increased by 65%. With the increase in deliveries, there is a demand for trucks on the road, resulting in more carbon emissions in our atmosphere. More recently, there has been research to help combat greenhouse gas emission to the atmosphere with better traffic signals. These wifi signals cut down on wait time at stop lights and reduce wasting fuel. These signals help automobiles adjust their velocity so that they can increase their chances of getting through the light, smoothing travel patterns and obtaining fuel-economy benefits. These small adjustments result in big changes in fuel savings. The cities that have started implementing smart light technology such as San Jose, CA and Las Vegas, NV. Light technology has shown to save 15-20% in fuel savings. According to the United States Environmental Protection Agency, transportation is the second leading source of GHG emission behind electricity and project that by 2050 freight transportation emissions will pass passenger vehicle emissions. Another technological advancements is truck platooning, trucks are able to send signals to neighboring trucks about their speed. This communication between vehicles reduces congestion on the roads and reduce drag, increasing fuel savings by 10 to 20%. With these tech implementations in major cities and towns, there is the ability to reach an optimal level of pollution given the rise of e commerce shipments. The figure above illustrates that decreasing emissions would result in the equilibrium for the market of shipping population, which can be done by consolidating packages, light technology, or truck platooning. ^ a b c Fuglestvet et al., Center for International Climate and Environmental Research (2007). "Climate forcing from the transport sectors" (PDF). ^ "Carbon Pathways Analysis – Informing Development of a Carbon Reduction Strategy for the Transport Sector – Claverton Group". claverton-energy.com. ^ Rodrigue, Dr. Jean-Paul. "The Environmental Impacts of Transportation". people.hofstra.edu. Retrieved 2016-04-14. ^ International Council on Clean Transportation, A world of thoughts on Phase 2, 16 September 2016 (page visited on 18 November 2018). ^ "CO2 emissions from passenger transport". eea.europa.eu. ^ Lee D.S., Pitari G., Grewe V., Gierens K., Penner J.E., Petzold A., Prather M.J., Schumann U., Bais A., Berntsen T., Iachetti D., Lim L.L., Sausen R. (2010). Transport impacts on atmosphere and climate: Aviation. In – Atmospheric Environment Transport Impacts on Atmosphere and Climate: The ATTICA Assessment Report. 44:37:pp.4678-4734. ^ "U.S. Energy Information Administration (EIA)". Archived from the original on 2004-11-01. Retrieved 2009-08-21. ^ "How much carbon dioxide is produced by burning gasoline and diesel fuel? – FAQ – U.S. Energy Information Administration (EIA)". eia.gov. ^ "Reducing CO2 emissions from passenger cars". ec.europa.eu. 2016-11-23. ^ Carpenter, T.G. (1994). The Environmental Impact of Railways. New York: John Wiley & Sons. ^ Carpenter, T. G. (1994). The Environmental Impact of Railways. New York: John Wiley & Sons. ^ "Royal Gorge Bridge". highestbridges.com. June 17, 2013. ^ Endresen, Øyvind; Sørgård, Eirik; Sundet, Jostein K.; Dalsøren, Stig B.; Isaksen, Ivar S. A.; Berglen, Tore F.; Gravir, Gjermund (2003-09-16). "Emission from international sea transportation and environmental impact". Journal of Geophysical Research: Atmospheres. 108 (D17): 4560. doi:10.1029/2002JD002898. ISSN 2156-2202. ^ "Klimakiller Flugverkehr - zur Umweltrelevanz des Flughafens Hamburg- Eine Information der Notgemeinschaft der Flughafenanlieger Hamburg". fluglaerm.de. ^ "Reducing your Road Haulage Carbon Emissions – Return Loads". returnloads.net. ^ "Transportation Mitigation Measures". teeic.indianaffairs.gov. Retrieved 2016-04-14. ^ "Transportation Solutions | Reimagine!". www.reimaginerpe.org. Retrieved 2016-04-14. ^ "UPS Pulse of the Online Shopper | UPS - United States". www.ups.com. Retrieved 2019-03-13. ^ Chao, Loretta (2016-06-13). "Online Shoppers Want Delivery Faster, Cheaper, Survey Shows". Wall Street Journal. ISSN 0099-9660. Retrieved 2019-03-13. ^ California, Andy Murdock, University of (2017-11-17). "The environmental cost of free 2-day shipping". Vox. Retrieved 2019-03-13. ^ "Amazon's new environmental report will show how bad two-day shipping is". www.msn.com. Retrieved 2019-03-13. ^ "Super-Fast Shipping Comes With High Environmental Costs". NPR.org. Retrieved 2019-03-13. ^ US EPA, OAR (2016-04-29). "Learn about SmartWay". US EPA. Retrieved 2019-03-13. Wikimedia Commons has media related to Transport and the environment. Nate Berg (January 5, 2016). "The future of freight: More shipping, less emissions?". Archived from the original on November 10, 2017. Retrieved November 10, 2017. John Schwartz (September 27, 2016). "An App to Help Save Emissions (and Maybe Money) When Buying a Car". NYT. Retrieved September 27, 2016.